The majority of my work makes use of photopolymer plates, produced from digital files to allow virtually any design to achieve the tactile, distinguished result only possible with letterpress printing. While I do have a large selection of vintage wood type that gets used for personal work and large posters, the use of custom plates allows me to work with graphic designers, artists, and creative agencies to transform their designs to a finished product. For clients in need of design services prior to printing, I have a group of talented graphic designers that I’ve worked with in the past that I often recommend for design work. The pressroom at Repeat Press consists of a 10×15″ Heidelberg “Windmill” platen press, a 10×15″ New Style Chandler & Price, and a Vandercook SP-20 cylinder press, capable of handling a 20×26″ sheet. Besides printing, all three of these presses are able to do die-cutting, scoring, and perforating. If you’ve got ideas for a project, questions about printing, or an uncle with some weird old press in his garage that he wants to get rid of, please be in touch! Was wondering if you ever take on interns? I’m working on my master of publishing in Vancouver and would like to learn more about letterpress. Currently Repeat Press is a one-person shop but as things expand in the future the possibility may open up. Drop me an email to keep in touch. How many presses do you have at your shop? 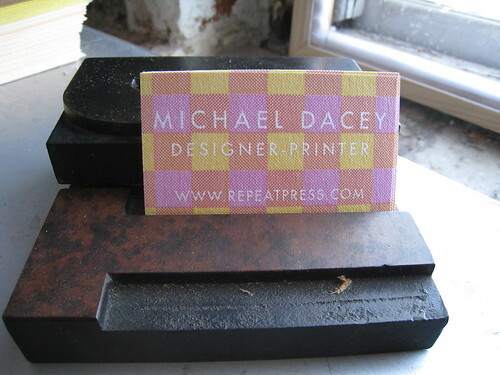 Vandercook SP-20, 10×15 C&P (new style), and a small showcard press that doesn’t see much use. 10×15 Heidelberg windmill arriving this month. Are you willing to print small scale projects? I do not have minimum quantities but the price per piece definitely become more affordable as the quantity goes up – get in touch and I’d be happy to work out a quote for you!